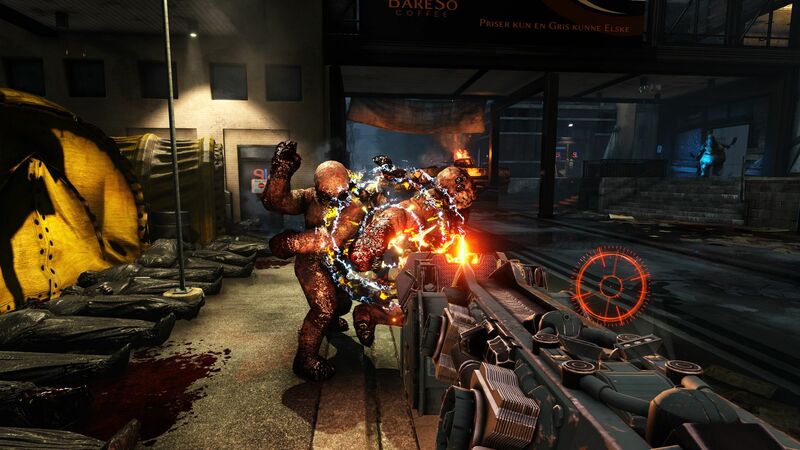 Shacknews goes a few rounds with the Killing Floor 2 Incinerate 'N Detonate update. There's nothing quite like the smell of burning Zeds. The Killing Floor 2 early access goes live with its newest update today, aptly named Incinerate 'N Detonate. It adds two new perks: the Firebug and Demolitions. Both of them are in the previous game, but now they're back with some big upgrades. There are also two new maps (Evacuation Point and Catacombs), along with some general improvements like an After Action game report to let you know how well you did, new Zed hit zones, new weapons like the dual 19mm pistols, and a complete overhaul of the Berserker skill tree. We dove straight into the new update to try the new classes. As expected, playing solo at level 0 is no easy task. I was overwhelmed by monsters in a matter of seconds. Like the previous game, you'll want to gather together as many players as possible before venturing into Killing Floor 2. So, I partnered up with a friend and went straight to the Catacombs map, because there's no better place to fight monsters than among the dead in the Catacombs of Paris. The map is a lot like something out of a out of an H.P. Lovecraft story or Doom. Skeletons decorate tall thick columns and walls of the central cathedral-like area, making for a macabre scene before blood is spilt. Soon, monsters (aka specimens or Zeds) began to pour out from just about everywhere, including an inconspicuous hole right in the middle of the floor. We made a run for the darkened caves, which is made up of "tourist" areas that are still under renovations, and at least one area that looks like a fetid pool of mud. At least, we hope it's mud. Catacombs is a big winding map, and it's very easy to get hopelessly lost. It's a good thing the new perks are so devastatingly powerful. I started things off with Demolitions, which is as wonderfully ridiculous as one might expect. Its main weapon is the HX25 Grenade Pistol, which fires one single explosive round at a time. It's fantastic for wrecking groups of specimens, but it's slow to reload, so I had to do a considerable amount of switching between the grenade gun and my regular 9mm pistol to make best use of the explosive rounds as the Zed hordes thinned out. Higher tier weapons include remotely detonated C4 charges, an M79 Grenade Launcher and a full RPG-7 launcher. Evacuation Point takes you to a ruined airport where you see the remains of a destroyed military encampment. Like the Catacombs, the map is very large, with multiple levels and areas that are blocked off with debris. Similar to Catacombs, it can be easy to get lost in the airport terminal, but there are plenty of doors to weld shut in an effort to drive specimens into a kill box. Here, I switched to the Firebug, which covers Zeds in flames to quickly roast groups to death. It doesn't have the same instant splatterfest gratification of Demolitions, but it does some serious damage. Its primary weapon is a custom modified double caulking gun called the Caulk n' Burn, which somehow shoots a steady flow of flames at the monsters. It doesn't have much range, and it quickly eats up ammunition. Plus, Zeds take a few seconds to die as their flesh sizzles off, but the fire damage is persistent. So, I could quickly light a few specimens up and make a run for it, letting the weaker ones die off while chasing me. Higher tier Firebug weapons include a Incendiary Trench Gun (a pump shotgun with incendiary rounds), a Flamethrower and a Microwave gun, which appears to be a very fancy laser beam rifle that lights targets (and possibly those close by) aflame with searing heat. Both Demolitions and Firebug have signature grenades. Demolitions tosses a half stick of dynamite, which will temporarily deafen teammates caught too close to the explosion with a persistent ringing. Firebugs throw Molotov Cocktails, igniting large groups in hot flames. Although grenades can hurts teammates, it doesn't appear as though main weapons do, which is really bad news for the Zeds. I almost started to feel bad for the monsters when both a Demolitions and Firebug perk came together. The two do so much damage in a wide area, that it sometimes seems like they barely have a chance. We would be even deadlier as we unlocked new skills, like the Napalm enhancement for the Firebug and the Nuke radiation poison damage for Demolitions. Except that the specimens come in huge numbers, and the lower tier weapons don't do a lot of damage against more advanced monsters like the Fleshpound. Oftentimes, I would get overwhelmed and killed while reloading, especially by Stalkers, who remain completely invisible until they strike and will attack in groups. Also, like in the previous game, Sirens can use their sonic powers to destroy explosive before they reach them, making the Demolitionist's worst enemy. With the intense area damage of both the Firebug and Demolitions perks, it should be pretty easy to clean out the weaker Zeds. However, things tend to get sticky when the big monsters appear, especially the final boss. High ammunition consumption and slow reloads keep the two perks in check so that other perks like the Commando and Berserker have a chance to step in. The returning Firebug and Demolitionist perks are amazing additions to Killing Floor 2. I didn't really take to them in the previous game, but now they're too incredible to overlook. Killing Floor 2 is in Early Access right now and the Incinerate 'N Detonate update goes live today soon.